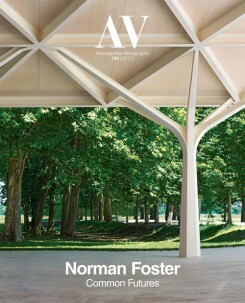 AV devotes this issue to the recent work of Norman Foster, coinciding with the exhibition organised by Fundación Telefónica with the Norman Foster Foundation in Madrid. The texts included deal with the twelve sections of the exhibition, complemented by a biographal profile of the British architect by J. M. Ledgard, an article by Paul Goldberger on the building of the Foundation in Madrid and the architect’s own thoughts on the spirit and objectives of this new institution. The future of building and of technique are analysed in articles by Neri Oxman on Mexico Airport and by Ricky Burdett on the Droneport project. Deyan Sudjic on the SkyCycle and Mohsen Mostafavi on Masdar explore contemporary sustainability and mobility.